On Saturday July 19th, before we delivered the sculpted Technics Turntable cake to the Koolau Golf Club, we drove out to the JW Marriott Ihilani Resort & Spa out in Ko Olina for Brandy's wedding. For her wedding, she chose the beautiful open air "Pavillion" venue at the Ihilani for her reception venue where she could entertain her 610 guests. Yes, 610 guests! 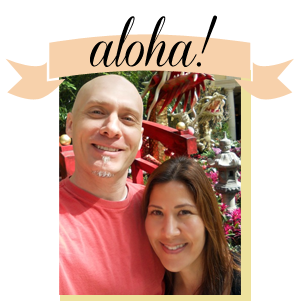 The bride and groom's family are of Hawaiian and Samoan heritage and large guest counts are very common. 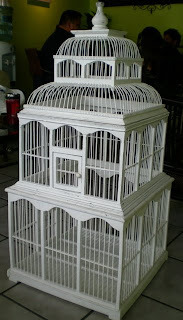 When Brandy approached us to make her wedding cake she mentioned that she was going to use a giant birdcage for her envelopes from her guests and possibly integrate the birdcage motif elsewhere in the reception. She wanted to have her cake in the shape of her birdcage and through collaboration with Rick, it was decided that her cake would borrow the shape of the wooden birdcage but still have the elegance of a wedding cake and borrow design elements from her wedding dress. 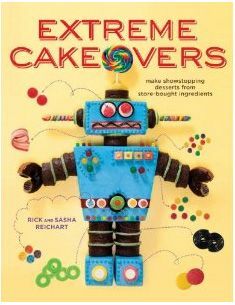 Rick made her cake in white pearlescent fondant with vertical columns representing the gathers in her dress and painstaking amounts of TINY delicate piping all over the cake. On the top of the cake, he added a "T" monogram for the new family name. To honor the heritage of the bride and groom, the couple chose our Local Kine Special and Guava Lava flavors. The Local Kine special, one of our signature flavors has a taro cream filling in a coconut cake. In addition to her wedding cake, she ordered a number of cakes on the side that she and her groom could gift their families with, which I thought was a very sweet gesture. My cake was so beautiful. I couldn't imagine a more gorgeous cake. You folks did an awesome job. When we cut the cake the servers started to cut the rest of the cake and it was all gone before I could blink twice. Thanks again! Brandy, we loved making your cake! Thank you for providing the many design inspirations to work from. We hope you and all your guests had a wonderful wedding. All the best to the newlyweds! 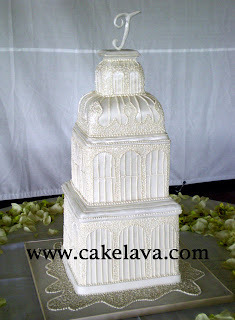 See Brandy's wedding cake and many other new cakes coming soon on cakelava.com.